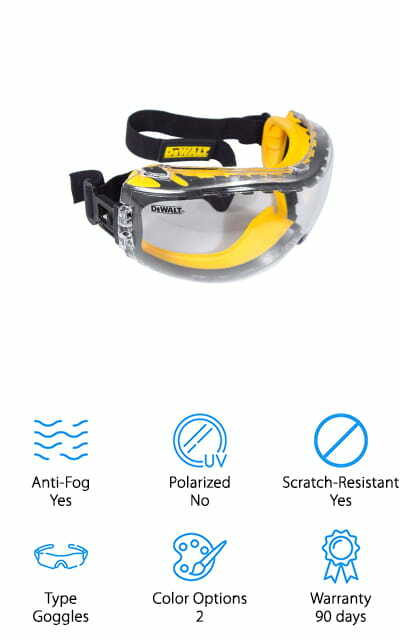 Anti-Fog: Anti-fog safety glasses are best for when you are working in environments that may be both hot and cold. While you are working in dangerous areas, it’s important that fog isn’t getting in your way. Polarized: Polarized filter glasses can significantly reduce the fatigue and eye stress that can be caused by excessive glare from surfaces caused by the sunlight reflecting off of things such as water, ice, glass, or paint. Scratch Resistant: Nothing’s worse than looking through glasses and constantly seeing a scratch in the middle of your lenses. 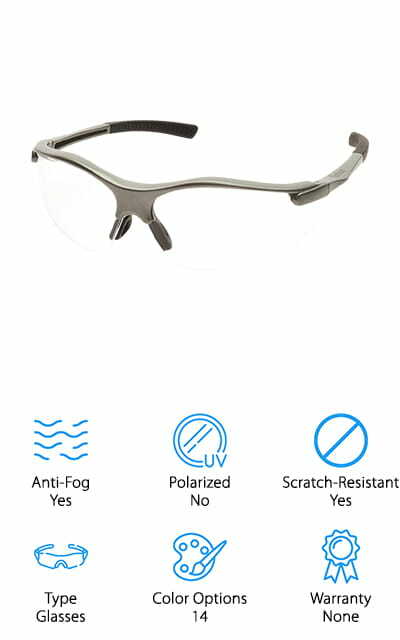 Scratch resistant safety glasses will help deter scratches that you might get from debris. Type: What kind of safety glasses do you prefer? Do you want the kind that are like regular glasses or something that can wrap around your head like a headband. This all depends on your personal preference and type of work. Color Options: This is more of a matter of personal preference. Do you want to be able to pick out the color of your glasses? Do you want them to match your uniform? These are both top considerations to make. Warranty: Every good product should have a warranty, especially if they boast of a special feature that doesn’t always pan out. The warranty can cover you from breakage, malfunction, or certain manufacturer defects. Now we move onto the actual product reviews. These are some of the top rated safety glasses on the market right now. We know that you might be in a hurry, so if you want the best of the best, skim down to number one, which is our top pick. If you’re on a budget, check out number two, which is our budget pick. Are you ready to read about these products? Alright, here we go. One of the most comfortable safety glasses come from Jackson Safety. The Jackson Safety Nemesis Polarized safety glasses are equally sporty, flexible, and lightweight. They feature a smoke tinted lens that is polarized for clarity and to help reduce the glare of most reflected light, stress on the eyes, tired eyes, and they are great for working out in the sunlight altogether. These glasses have soft touch temples, allowing you to wear them for extended periods of time. They also come with the optional wraparound protection. You can wear the glasses with or without the headband attached. These are both comfortable and offer a non-slip grip around your head, especially with the headband. These high-quality safety glasses are appropriate for both men and women and offer 99.9% UV protection as well as a 1-year warranty. 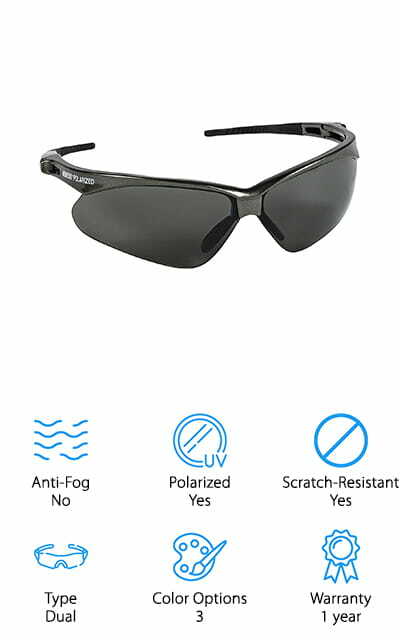 You can also use these while at the shooting range for anti-glare, construction, golfing, fishing, road work and more. If you are on a budget, then the 3M Virtua Protective Eyewear are the best cheap safety glasses that you may be able to find. These glasses are really rather unique because they have ear protection attached to them. The ear buds are attached to a cord to keep them securely in place. The CCS feature allows them to dangle without being lost. It also helps to keep them untangled and always ready to use. The glasses feature a wraparound design that allows for extended eye protection and a view that is unobstructed. There are also foam gaskets that help to limit exposure to the eye from dust while also providing additional cushioning. The lenses are made from a polycarbonate material that helps absorb 99.9% of UVA and UVB rays. The lenses are also clear with no tinting to them. These may be the best safety glasses for sale that come at an affordable price. Dewalt is a name that is widely known in the construction and contracting industry. From their generators all the way to their small products, it is a brand that can be trusted. When it comes to their safety goggles, these are the best safety goggles over safety glasses for a decent price. They feature s tough coat hard coated lens that is both scratch resistant and fog-proof. 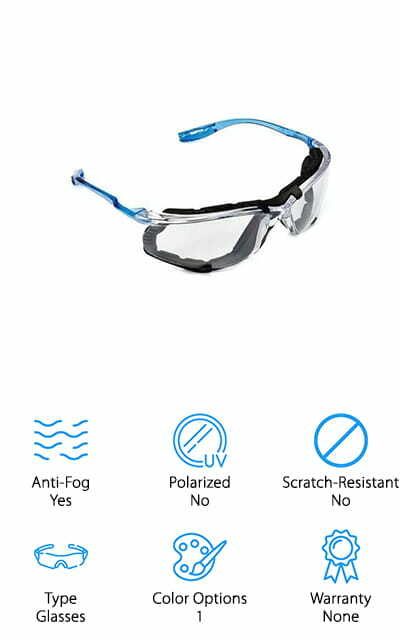 The anti-fog lenses coating always provides protection against fogging when you need it the most. They are made of a soft, dual injected rubber that conforms to your face to give you maximum protection from debris and dust that might be flying around. Attached to the goggles is an adjustable, elastic cloth that wraps around the head for a comfortable and stable fit. Within the goggles are ventilation channels that allow optimal breathability and adds to the fog protection. You can get these in two different lens colors if you are a fan of options. The NoCry Safety Glasses are some of the best scratch resistant safety glasses that you can get that are on this list. They are made from a strong and durable polycarbonate material with a wraparound construction. They protect the eyes from 99.9% of harmful UV radiation. They are customizable for the perfect fit and comfort. The side and nose pieces can be adjusted to ensure that the glasses don’t slide off of your face, no matter what face type or head size. They are fog, glare, and scratch resistant for the ultimate in versatility. And what’s more? They are ideal for carpentry, metal, construction work, lab, dental, and woodworking, plus more. The double coated and untinted lenses mean that they won’t fog or cause an optical distortion so you can see better at all times. They are backed by the NoCry guarantee. There is no set warranty, but if there is ever an issue with your glasses, the company will “make it right”. These Encon safety glasses are semi-rimless and offer a wraparound design with slim temples. These lenses are untinted and can be used both in and outdoors without having an effect on the color recognition. They also help protect the eyes from 99.9% of harmful UVA and UVB light with wavelengths up to 385 nanometers. They have a soft nose piece for a comfortable and secure fit. The lenses are made with a polycarbonate lens that can resist impact and have an anti-scratch coating to give the lenses a longer lifespan. Nothing is worse than looking through scratched glasses, especially if you are going intricate work that calls for no mistakes. These are fog-resistant, but not necessarily fog-proof. 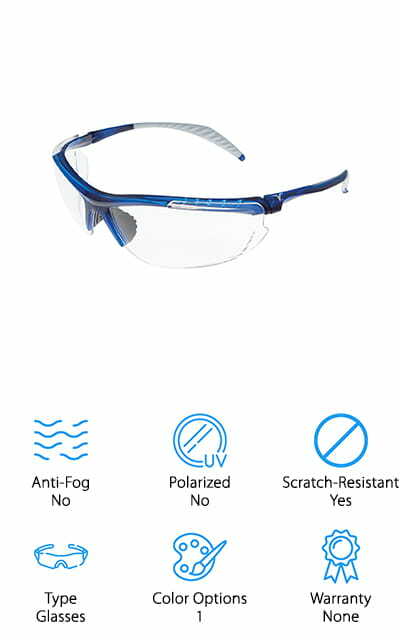 The Encon Veratti Safety Glasses are affordably priced and come in a blue frame color with clear lenses. It’s tough to find a pair of goggles that are both effective and that can fit over prescription glasses with ease. The Gateway Safety Glasses are an exception to this as they do fit over most prescription glasses. They wrap around the side of your face for optimal debris protection, making them some of the best safety glasses for dust. These revolutionary goggles offer a compact and modern style. Since these are of a smaller size, they are very lightweight, making them easier and more comfortable to work in. Not to mention, they are equipped with soft and adjustable temples. These are an extremely cost effective solution to your problems that won’t break your bank. These are not specifically fog-proof, but there have been mixed feelings about the fogging or not fogging. They are, however, scratch-resistant. These give them a longer lifespan and save you from having to look through pesky scratches while you are working. Some of the best safety glasses for work come from Pyramex. Their Pyramex Fortress Safety Glasses are very lightweight and sporty to boot. The design contours to your face to protect from debris as well as providing the ultimate comfort for all face sizes and shapes. The vented lenses allow air to flow away from the lenses to prevent them from fogging up, making them possibly one of the best anti-fog safety glasses on the list. These glasses come with a straight back with a rubber coated temple for your comfort. They also have an anti-scratch lens that offers you 99% protection from UV rays. The anti-scratch feature is a great one to have because it adds to the longevity of the product. Not to mention, you won’t have to worry about those pesky scratches blocking your view while you’re trying to work. These are also very decently priced, ensuring not to break your bank. Carhartt is another name that has been trusted and loved for over 100 years. The Carhartt Carbondale Safety Glasses can be used in the garage, on the shooting range, and even in the lumber yard. They feature scratch resistant polycarbonate lenses that give you full impact protection. These lenses also protect you from 99% UVA/B/C rays. They are also very versatile, making them the ideal product for a wide array of activities. The temples on the glasses are also very stylish and flexible. The frames are the standard two-tone Carhartt colors of brown and black. The rubber nosepiece helps to keep the glasses securely on your face, no matter what shape or size. These are some of the best safety glasses for construction because of their solid frame and lightweight girth. These glasses are 2.5” high, 3” wide, and meet the ANSI z87.1 and CAN/CSA Z94.3-07 safety specifications. 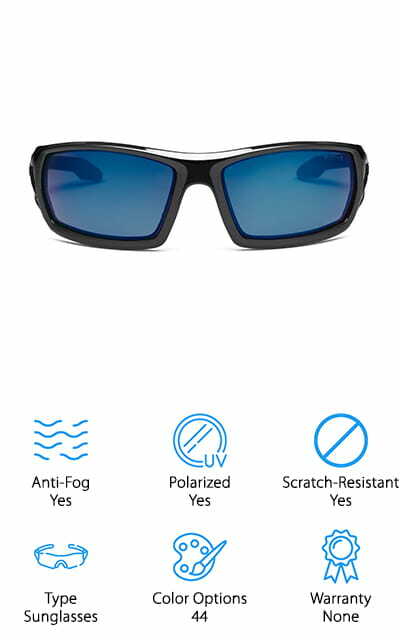 First thing first, these glasses have 44 different color options with a combination of fog-proof and polarized, meaning you can pick a pair that has the feature or one that doesn’t. So just remember that you can pick between the two. 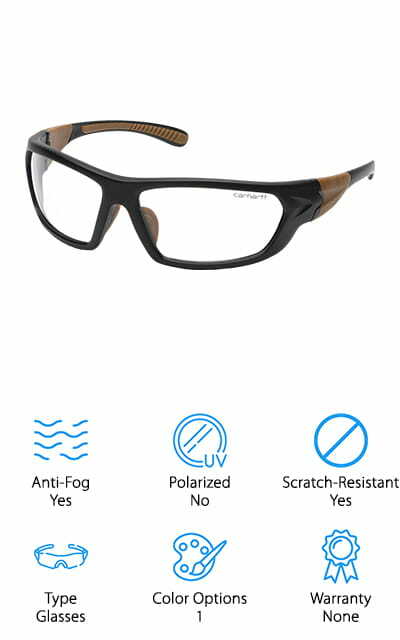 Now, the Skullerz Odin Safety Glasses are some of the best safety glasses for anti-fog and anti-scratch that are on this list. They feature a durable, flexible, and lightweight full frame construction that offers you a comfortable fit. There are rubber nose pieces that prevent the glasses from slipping off of your face while you are trying to work. They also resist sweat, which is a pretty cool feature. There are also optional foam gasket inserts that help reduce dust and debris entry or for converting it into a goggle by adding the strap. These are both sold separately. These help protect your eyes from harmful UV rays and can be used for a variety of activities. 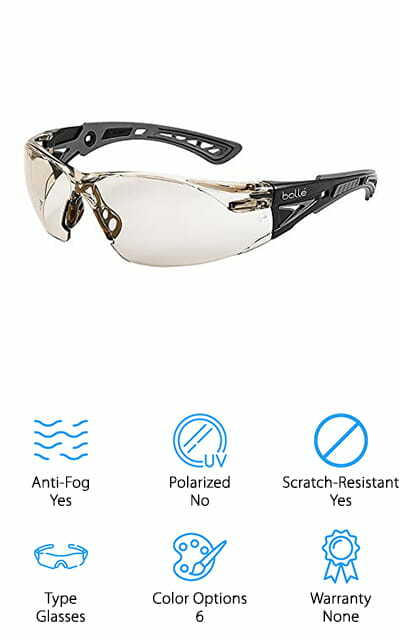 Last up on the list is the Bolle Rush+ Safety Glasses. These come in six different colors such as light amber, smoke, twilight, clear, grey and clear. These, like most of the others, are scratch-resistant. This adds to the longevity of the product and also will help you to see better rather than having to look through the scratches. 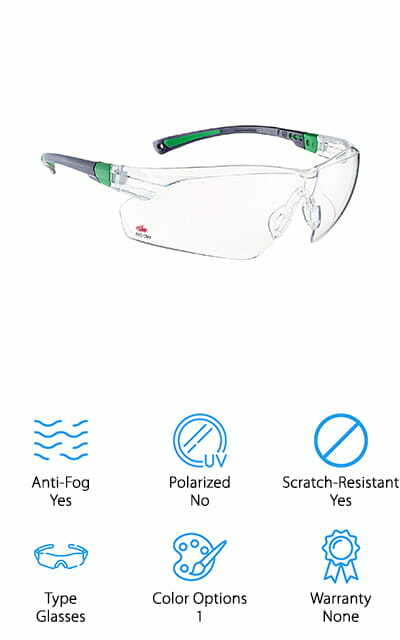 These are also fog-proof so that you can work in both moist and dry areas without the glasses fogging up. The lenses also have 99.99% UVA and UVB protection, so your eyes will be protected from those harmful rays if you are working outside. The glasses are also equipped with co-injected and ultra-flexible temples for long wear without discomfort. 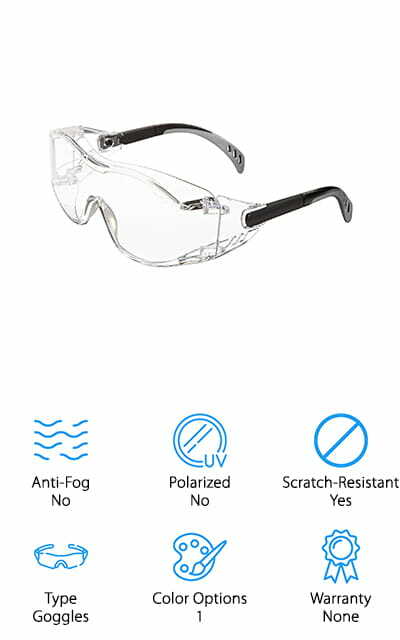 Overall, these are some of the best safety glasses for anti-fog on the list and they are very comfortable and lightweight.